Early On Michigan Foundation | Welcome! The Early On® Michigan Foundation welcomes you to explore our work and join us as we strengthen Early On Michigan programs for infants and toddlers with special needs and their families. The Early On Michigan Foundation recommends an incremental increase in state funding for Early On over the next four years in order to reach $68 M. For 2019-20 (FY 20), that means a total state allocation of $20 million. State Allocation for Early On! The Early On Michigan Foundation is pleased to see $5 million in the State of Michigan Budget for 2019. This signals a significant first step for Michigan's families who have infants and toddlers with developmental delays and disabilities. The estimated need for state investment is close to $70 million. We encourage our partners to keep this in mind and to educate colleagues and decision makers about the need for effective early intervention services in order to promote the best outcomes for young children. The Early On Michigan Foundation formalized a request for an initial state allocation for 2018-19 (FY 19) to support early intervention services and is pleased to share that our partners, Michigan Association of Administrators of Special Education (MAASE) and the Michigan Division for Early Childhood (MiDEC) have endorsed the request. While the estimated need for state funding is more than $67 million, our initial request is for $19.6 million, acknowledging that meeting the need can be incremental. The Early On Michigan Interagency Coordinating Council (MICC) and the Michigan Association of Administrators of Special Education (MAASE) released reports in November and December, 2016, related to Early On Michigan. In these reports, both the MICC and MAASE address fiscal and structural issues of the system and call for increased funding for Early On. To learn more, check out their reports here. Early On Michigan provides services to families of infants and toddlers, birth to age three, who are eligible because they have a delay in development or a medical condition that is likely to result in a delay. New parents who find themselves caring for children with special needs, from minor delays to significant disabilities, often need services for their children (such as speech therapy or physical therapy) and support (such as strategies for feeding and bathing) in order to help their children develop. Children and their families need support so that they can grow, develop, and be as ready as possible for success with friends, in school, and in life. View Nicholas's story to learn more. Share information with your State Representative and/or State Senator about the need for state funding for Early On. Early On uses evidence-based practices in working with families. Research, talking points, and State Representative/Senator contact information are available under the Resources tab. Get involved. Volunteer to serve on your Early On local interagency coordinating council. Contact information for your Early On Coordinator is listed here. Donate to the Early On Michigan Foundation. Your tax-deductible contribution will provide resources toward strengthening Early On and establishing state funding for Early On. Donating is easy online or by writing a check to the Early On Michigan Foundation and sending it to the address below. On March 10, the Early Childhood Investment Corporation and Michigan's Children, with funding from the Alliance for Early Success, hosted an in-depth discussion of Early On Michigan to learn about how other states have structured the implementation and funding of Part C of IDEA early intervention programs and policies. The day featured presentations from Maureen Greer, Executive Director of the IDEA Infant and Toddler Coordinators Association, Vanessa Winborne, State Part C Coordinator, as well as Cheryl Granzo and Rich Van Tol with perspectives from Ionia and Genesee counties. Consultants from Zero to Three and the Ounce of Prevention Fund facilitated the discussion. On January 14, the Early On Michigan Foundation met with Lt. 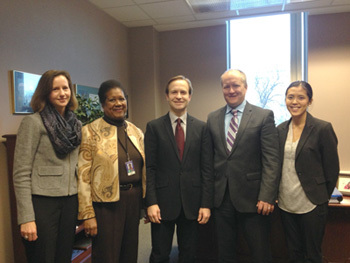 Governor Brian Calley, along with Vanessa Winborne of the Michigan Department of Education and Matt Gillard and Mina Hong of Michigan's Children, to discuss the needs of the Early On system. The Early On Michigan Foundation was a part of an effort to ask Governor Snyder to support Early On through new funding in the Department of Education 2016 budget. Mina Hong, a Foundation Board member who works for Michigan’s Children, coordinated a “sign-on letter” requesting the funding. Please reach out to your legislators and request state funding for Early On!